Stamped concrete is a flooring material used in homes and businesses that is becoming more and more popular. It is also known as textured concrete, because it can be designed to resemble the look of slate, tile, and hardwood, making for a much less expensive version of your favorite flooring designs. Stamped concrete can be used in almost any space, and is a great way to elevate the area around a pool or patio. It is very cost effective for its low maintenance nature, although, a professional cleaning company should still be employed to clean and maintain the surface of the concrete. Stains on stamped concrete can be difficult to clean because of its naturally porous characteristics. 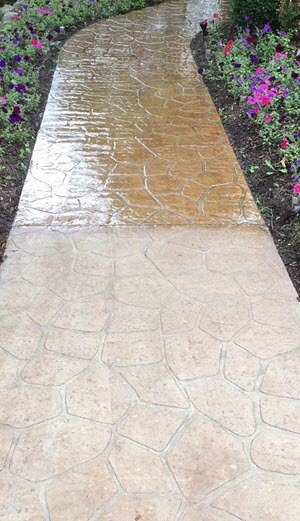 This allows liquids and moisture to easily absorb into the concrete, seeping into the fissures and becoming a part of the makeup and design aesthetic of stamped concrete. There are some basic cleaning practices you can do yourself, such as using dish wash liquid to break up any liquid or grease, however, DIY jobs do not typically get the job done. A professional cleaning company is trained to use the most powerful cleaning technologies, such as pressure washing, to effectively and adequately clean your stamped concrete from all stains and spills. Not only will this cleaning maintain the desired look of the concrete, but it will also maintain its health and lifespan by removing all material and particles that can make its way into the structure. Pressure washing is the most effective way to maintain the aesthetic and lifespan of your stamped concrete. Before you had your concrete flooring or patio base installed, you most likely took the time to choose your favorite design, texture and color. Therefore, you should take the necessary time to perform regular cleanings to maintain the look you first loved. Power washing can be dangerous to tackle yourself, and can even end up in personal injury. Professionals are experienced in the proper methods of cleaning concrete, and are much better equipped to handle your investment. Once your stamped concrete deck, patio, or pool area is thoroughly cleaned, it should be sealed with the proper products. A sealant will act as a barrier to moisture and will protect the material against fading and debris from attaching itself. Water damage is one of the most common forms of damage on stamped concrete, since it can compromise its structure by weakening the bonding agents. It can also affect the aesthetic by creating surface spots and stains. A sealer will naturally wear out over time and lose its insulating strength, therefore, it is important to have your stamped concrete structure re-sealed every 4 to 6 months. This will effectively protect your concrete against dust and dirt becoming trapped, as well as sunshine from fading your desired color. Be sure to keep an eye on your stamped concrete structure, and make sure you hire a professional cleaning company to have it routinely cleaned and sealed for the most well-kept and best looking concrete. If you have any questions regarding professional stamped concrete cleaning and sealing in Oakland County, give Kwik Klean a call today, for the highest quality stamped concrete services.